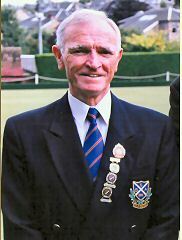 Secretary David A Barnett has been club secretary for ten years and served the club as President in 1994, he has been a stalwart for our club all these years and in recognition for this he was made an Honorary President, the 19th man to receive this honour in our 133 year history. for his sterling service to the club on the bowling green. at all levels throughout his bowling career. Congratulations to both of these gentlemen. An absolutely fabulous evening performed by PiggeryBrae. Your webmaster President Will McArthur chaired the evening and ensured the whole event went like clockwork. After introducing his guests he asked Alastair MacFarlane to get the Scottish evening started with the Selkirk Grace. Kenny Wilson Director of Bridgeton Burns Club, address tae the haggis & Holy Willies prayer was par excellence and had the company in raptures. 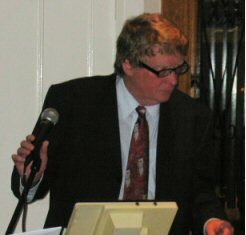 Ian Robb, Past President of Bridgeton Burns Club delivered a wonderful Immortal Memory which the bard himself would have enjoyed. the last toast of the evening the toast tae the lassies was delivered by Jim Ferguson (Fergi) he delivered a clever, funny speech which had the crowd in tears! Vote of thanks was delivered by club Secretary David Barnett. Throughout the evening PiggeryBrae sang their hearts out and performed about 20 classic songs that had the whole hall on their feet clapping and cheering............. what a brilliant evening. I can't thank everyone enough for making this such a great night, my pals in PiggeryBrae, my social committee, my members who brought along their friends and guests all made this evening the success it was......thank you. It was a pleasure for me as President to chair the evening and entertain the company with my pals in PiggeryBrae! Opening Day brilliant sunshine !!! A excellent opening day well attended by members, visitors and friends. VIP guests included Depute Lord Provost Russell Clearie, SBF rep Ian Richardson, GBA rep Jim Proctor, RDBA rep Hugh McNulty and Presidents, Past presidents, members and friends from local bowling clubs. The Board of Directors were welcomed onto the green and our six newest members, Iain McArthur, Don Gillespie, Alex Goodfellow, Robert Park, David Paton & John Barton were also given a warm welcome. Another great start to our season as we took along a full team of six rinks, friends, wifes and girlfriends! This outing was headed by the club's Vice-President Jim Low. Troon Portland v CBC got rained off and was declared a draw.